Join us at the eighth annual AGM protest: 28 August 2012 2.00 pm, Lincoln Centre, 18 Lincoln’s Inn Fields, London WC2A 3ED. Nearest tube Holborn (Piccadilly & Central lines) or Chancery Lane (Central). We are also calling out for a global day of action. Please show your solidarity with movements across India and Africa fighting this devastating company. Email your pictures or statements to savingiceland (at) riseup.net. 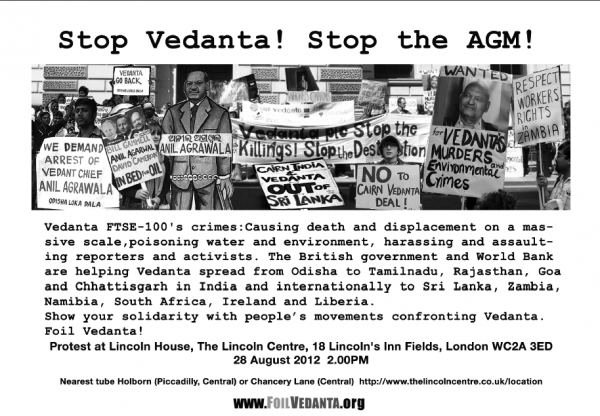 Vedanta plc is a London listed FTSE100 company which has brought death and destruction to thousands. It is owned by billionaire Anil Agarwal and his family through companies in various tax havens. It has been consistently fought by people’s movements but it is being helped by the British government to evolve into a multi-headed monster and spread across India and round the world, diversifying into iron in Goa, Karnataka and Liberia, Zinc in Rajasthan, Namibia, South Africa and Ireland, copper in Zambia and most recently oil in the ecologically fragile Mannar region in Sri Lanka. Vedanta’s bauxite mining and aluminium smelters have left more than ten thousand displaced people landless, contaminated drinking water sources with ‘red mud’ and fly ash,and devastated vast tracts of fertile land in an area which has seen famine every year since 2007. Vedanta’s mine on the sacred Niyamgiri hills has been fought by Adivasi (indigenous)-led people’s movements for seven long years and has so far been stopped. This has rendered their subsidiary Vedanta Aluminium (VAL) a loss making company, starving it’s refineries at Jharsuguda and Lanjigarh of local bauxite. Vedanta’s Sesa Goa subsidiary has been accused of large scale fraud and illegal mining.In June 2009 following a pit wall collapse which drowned Advalpal village in toxic mine waste, a 9year old local boy Akaash Naik filed a petition to stop the mine and mass protests later that year halted mining at one of Sesa Goa’s sites. In 2011 there were more major mine waste floods. In South Goa a 90 day road blockade by 400 villagers succeeded in stopping another iron ore mine. Sesa Goa are paying ‘silence funds’ to try and prevent similar action at their South Goa mine. Vedanta subsidiary Sterlite has flouted laws without remorse, operating and expanding without consent, violating environmental conditions, and illegally dumping toxic effluents and waste. In 1997 a toxic gas leak hospitalised 100 people sparking an indefinite hunger strike by a local politician and a ‘siege on Sterlite’ that led to 1643 arrests. Later that year a kiln explosion killed two. An estimated 16 workers died between 2007 and 2011. Police recorded most workers deaths as suicides. Pollution Control Boards, judges and expert teams have on several occasions reversed damning judgements of the company, demonstrating large scale corruption and bribery. Activists are waging a court battle which has stopped operations for several short periods. Vedanta bought MALCO ‘s aluminium complex at Mettur 2 years before permission for their Kolli Hills bauxite mines expired but continued to mine illegally for 10years. Five adivasi villages were disturbed and a sacred grove destroyed before activist’s petitions stopped mining in 2008. Without local bauxite and with protests preventing bauxite coming from Niyamgiri in Orissa the factory at Mettur was also forced to close. However, the abandoned and unreclaimed mines continue to pollute the mountains and a huge red mud dump by the Stanley reservoir pollutes drinking water and blows toxic dust into the village. Vedanta bought the state owned BALCO’s alumina refinery, smelter and bauxite mines for ten times less than its estimated value in 2001 despite a landmark 61 day strike by workers. Since then wages have been slashed and unionised workers are losing jobs. In 2009 a factory chimney collapsed, BALCO claimed 42 were killed, but in fact 60 – 100 people are still missing. 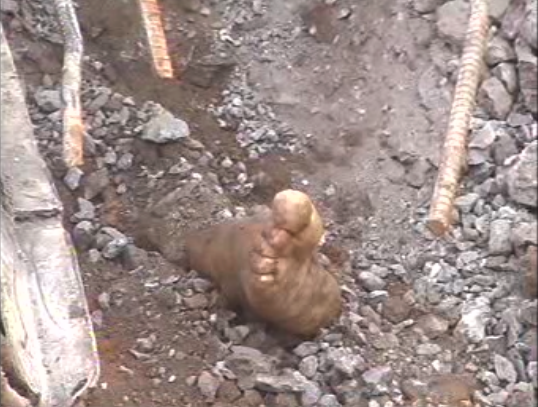 Witnesses claim these workers from poor families in neighbouring states are buried underground in the rubble, which was bulldozed over immediately after the collapse. The UK’s Department for International Development (DfID) and Department of Trade and Industry (DTI) helped launch Vedanta on the London Stock Exchange and continues to support the company. Through the World Bank funded NGO Business Partners for Development, it has helped Vedanta take over copper mines in Zambia . Although Vedanta has been fined for poisoning the Kafue river and faced workers protests, the UK is helping establish it in Zambia by securing in the words of local NGOs “ a ‘champion’ within central government to further the ‘enabling environment’”. Meanwhile in Liberia in what has been described as one of the worst recorded concession agreements in the country’s history Sesa Goa is accused of breach of contract and may have to pay damages of US$10 billion. Most recently when the Indian government held up Vedanta’s deal with Edinburgh based Cairn Energy by investigating Vedanta’s ability to manage strategic oil fields, UK government officials, briefed “over dinner” by Cairn Energy, offered to “polish” and send a letter drafted by the company to the Indian Prime Minister to force the deal through.David Cameron even personally intervened, urging India to speed up ’unnecessary delays’. As a result the Indian government caved in and allowed a deal which handed some 30% of India’s crude oil for a fraction of its worth to this notorious corporate. Vedanta’s Cairn India is now drilling for oil in the ecologically fragile off-shore region around Mannar in Sri Lanka – an area controlled by the Sri Lankan military. Vedanta is funded by more than 30 major banks and financial agencies including HSBC, Deutsche Bank, Axa, Royal Bank of Canada, Credit Suisse, J P Morgan Chase, Goldman Sachs, Lloyds Banking Group, Nordea Bank, HSBC, ICICI, Citigroup, National Bank of Kuwait, ANZ and Merrill Lynch. The University Superannuations Scheme (USS) pension fund, the Royal Bank ofScotland (RBS) and Cheshire, Suffolk, Wolverhampton and Leicestershire county council’s pension schemes hold large investments. But the Norwegian Government Pension Fund, Martin Currie Investments, the Church of England, the Joseph Rowntree Charitable Trust and the Dutch Pension Fund PGGM have divested because of Vedanta’s ecological, and human rights crimes. Vedanta’s CEO, Anil Agarwal one of the richest people in Britain, whose personal wealth has grown even in the recession by 583%. Agarwal and Vedanta have close links with the Sangh Parivar, the umbrella group of Hindu right-wing organizations in India responsible for genocidal attacks on India’s minority Muslim and Christian communities, in Orissa, Gujarat and elsewhere. PEOPLE’S MOVEMENTS AND INTERNATIONAL SOLIDARITY ARE A POWERFUL COMBINATION! People are fighting Vedanta in Asia and Africa. They have succeeded in weakening Vedanta. Join us in fighting them in London! Download the call out here. Download the flyer (containing the text above) here. Download a newsletter on the impact on six Vedanta affected communities here.